Hustle off to the newsstand and grab a copy of the December issue of Popular Science magazine, which features the 21st annual "Best of What's New" review. The magazine describes it as "a celebration of our wildest technological dreams" and spotlights dozens of "long awaited or completely unexpected, (and) equally amazing" recent scientific and engineering breakthroughs. Even better: Popular Science used SnapTell's Snap.Send.Get solution to make the entire Best Of What's New section interactive -- just use your camera phone to snap a picture of any of the pages (see the magazine for specifics), send the image to popsci@snaptell.com (AT&T, Verizon and Alltell users can send via shortcode 070707) -- and you'll get a spiffy digital image of a vintage Popular Science cover, an instant response from some of the Best Of What's New award-winning companies, and a chance to win a Garmin nüvi 500 GPS device. SnapTell is in glitzy company this week. Us Weekly, a celebrity and entertainment news magazine, has used SnapTell's Snap.Send.Get mobile marketing platform to mobilize select ads in its current issue. 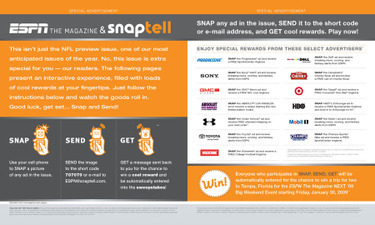 Readers use their camera phones to Snap any of the interactive ads in the issue, Send the image to us@snaptell.com, will Get a chance to win a trip to attend an Us Weekly celebrity luncheon. Each Snap.Send.Get-enabled ad also offers readers free goodies -- including exclusive ringtones, and chances to win holiday gift baskets and gift certificates from leading retailers. Here at SnapTell we spend a lot of time thinking and talking about what we call the GET -- the content that a brand offers to consumers as part of an interactive image-recognition based marketing campaign. Here’s what we’ve learned about the type of content that tends to spark a consumer’s interest, inspiring them to reach out to an advertiser and initiate a conversation. This seems painfully obvious, but it’s sometimes overlooked: if the GET isn’t appealing consumers won’t bother to connect. Conversely if the GET is interesting, amusing or unique, consumers will not only engage they’ll also likely share the GET with others and become evangelists for the brand. There’s nothing more frustrating to an interested consumer than a GET that they can’t get. Tailor GETs to the broadest possible audience by making SMS, available on over 98% of the world’s phones, a standard initial response. While mobile delivery of video content is clearly the future it is not yet accessible to all users on all networks on all phones, so resist the temptation to offer video as the only GET option. Targeting the GET to the lowest common denominator does not mean offering boring text-only content. For example The Weinstein Company’s recent full length feature film release of Morgan Spurlock’s “Where in the World is Osama Bin Linden?” asked consumers to snap a picture of the movie poster at the theater, in local newspaper print ads or from one of the thousands of flyers distributed in five major cities. Consumers then received multiple GET options including a simple short text synopsis of the movie with links to view the theater preview of the release, links to Yahoo movie reviews, and geo-specific content for local movie theater times with the option to purchase tickets via Fandango. In addition, every consumer who participated in the campaign was instantly entered into a sweepstakes in the local market. Over 40% of consumers who snapped a picture of the movie poster drilled multiple layers down to seek out more information about the content and the movie -- far better than the average .02% click through rates achieved by online banner ads. SnapTell-activated ads are returning to the pages of Rolling Stone, after our successful debut in the magazine last May. But wait; there’s more! 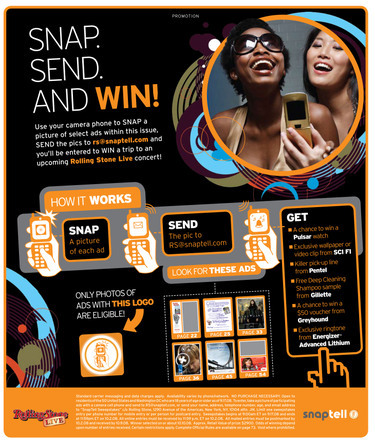 Everyone who snaps and sends a picture of any of the SnapTell-enabled ads in the magazine is also automatically entered to win a trip to an upcoming Rolling Stone Live concert. Readers of Rolling Stone aren't the only ones to benefit of course. SnapTell's "Snap.Send.Get" mobile marking solution transforms static print ads -- or any existing marketing collateral -- into a measurable, two-way communication tool for brand owners. For more information on our Snap.Send. Get mobile marketing platform, please visit our website or email us. 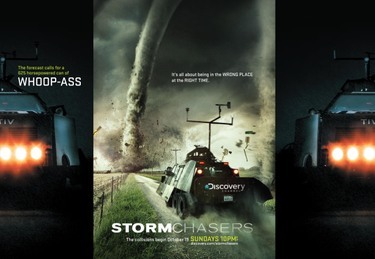 Attention adrenaline addicts: the Discovery Channel’s Storm Chasers show will be returning to a TV near you in mid-October! The coming season features new high-tech tricked-out vehicles, new teams and new strategies for delving into the heart of Mother Nature’s most intense experiences without getting your face and/or assorted appendages ripped off in the process. 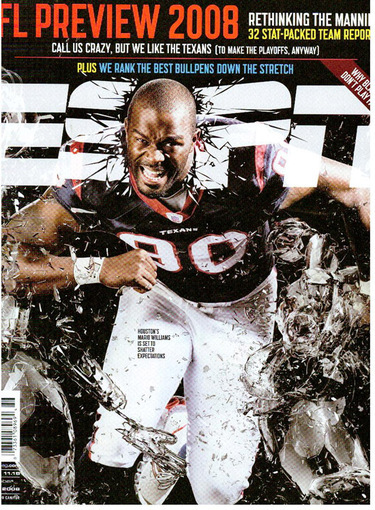 And to soothe your Storm Chaser needs until the new season premiers on October 19th (Sundays at 10 p.m), pick up a copy of Wired Magazine’s October issue (on sale now). 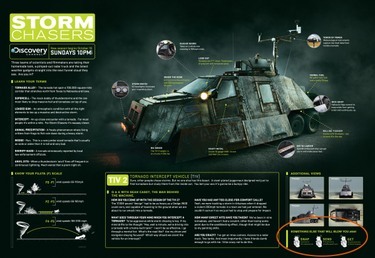 There’s a great ad from Discovery Channel with information on one of the coolest Storm Chaser trucks, a dictionary of weird weather terms (do you know what a “Wedge” is? Animal Precipitation? Anvil Zits? If not, you will after you read the insert). And there’s also a terrific bonus offer that will totally blow you away: Snap a picture of the ad using your phone’s camera, Send it in an MMS to wired@snaptell.com, and you’ll almost instantly Get an exclusive Storm Chasers clip on your mobile phone. The Discovery channel used SnapTell’s Snap.Send.Get mobile marketing platform to power their Storm Chaser clip offering. Snap.Send.Get can turn any image associated with a brand into a dynamic mobile marketing campaign. 100% permission-based, Snaptell’s Snap.Send.Get mobile marketing solution enables brand owners and retailers to communicate directly with consumers, within seconds of the consumer's request for information. For more information, please email SnapTell.